Performing serious music in an entertaining fashion” has been a trademark for Go for Baroque since it’s inception in 1985. G4B brings a wealth of experience and a sense of humor and humanity to their audiences. The ensemble utilizes the traditional instrumentation of violin, cello, harpsichord and trumpet, and also includes the velvet sounds of flugelhorn and guitar, creating a texture of sounds that warm the heart and tantalize the ear. Our audience members always leave with a smile, or a tear, having experienced a journey into the past and a stop in the present….a moment to be still and be part of the music so elegantly performed and eloquently presented by Go for Baroque. Championing the idea that music does not exist in isolation, the ensemble’s main goal is to build connections between the arts, education, and community development. 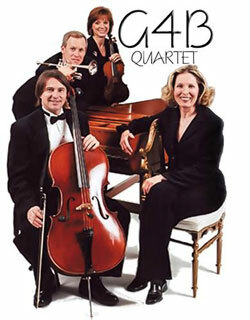 Heralded for their unique choice of repertoire and warm personal approach to chamber music, this very talented group of musicians creates the intimacy in a style of performing which has brought them acclaim as…..Go for Baroque!